Always Playing with Paper: The Challenge & I Slipped! The Challenge & I Slipped! Happy Tuesday! Today was a SLIPPERY day and I had to go to work. We had a HUGE snowfall not typical of the area and today the snow and streets were like a sheet of ICE! Off I went to work and on my way out to my car this morning, I slipped on the top stair in front of my house and went zooooom to the bottom of the staircase. Wow. Talk about PAIN. I have a huge goose-egg on my left leg and a large welt across the middle of my back. Not a great start to my day! Argh! LOL! Last night I managed to get crafty and created a simple gift set from the adorable Zoo Babies Stampin' Up stamp set I purchased in the Fall! LOVE how it stamps!!! It is pure cuteness! 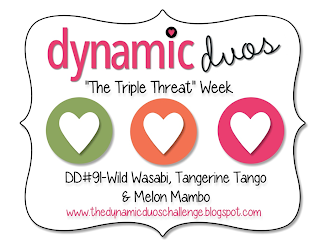 I used the fun colours over at Dynamic Duos...love them! 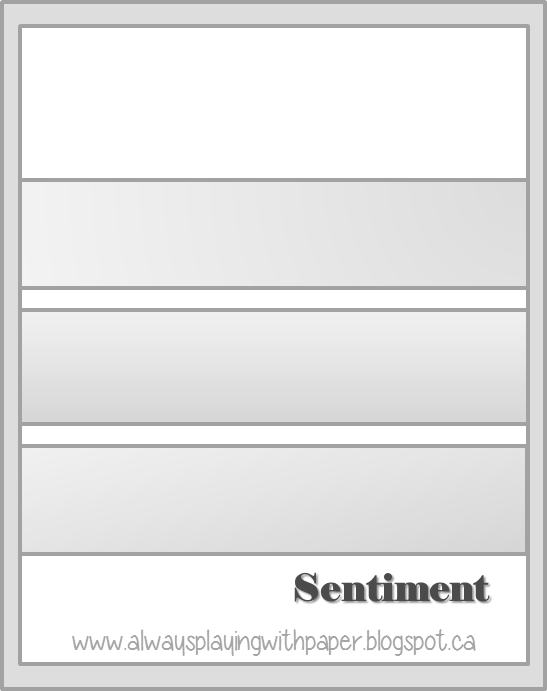 I got to thinking about the sketch I used to create the card and I realized how simple it was and that it could be interpreted in MANY different ways. How would YOU use this sketch? Why not try it out and link it up? I would love to see what you create with the sketch. Have fun with it...make it your own and do not worry about measurements. I can't wait to come and see what you make! All stamping product is welcome. Oh Lesley: the description of your fall has me cringing in 'empathetic' pain! Poor you! Make sure you're taking it easy: a sore back is no fun; neither are goose-egg on your leg! Hope your husband is spoiling and pampering you! Your card and tag: DARLING! From the colours, to the layout, to the zoo critters: absolutely adorable! Pure cuteness: yes!! Thank you for the sketch challenge; I'll do my best to play! So sorry to hear about your fall. Very thankful you didn't break anything but I can imagine how sore you must be. I love your card and am thinking of how I can use this sketch. :) Thanks for sharing! I hope you feel better soon. I'm so afraid of falling. Sometimes the more you try to brace for the fall, the worse you get hurt. Hope yours isn't too bad! I love your sweet animal card. It's a perfect choice for the beautiful color combo! Oh my goodness Lesley!! I hope you will be alright!! Lesley are you okay? That is horrible and I know exactly the pain you are talking about. So sorry your day started off like that. On to your card and bookmark--love love love them both! I will be picking up that set with my next order, it is just too cute! Great aketch and challenge. Hope you are staying in tonight. OUCH!!! I hope you didn't do too much damage to yourself....man, we have had lots of icy days like that!! Be careful! 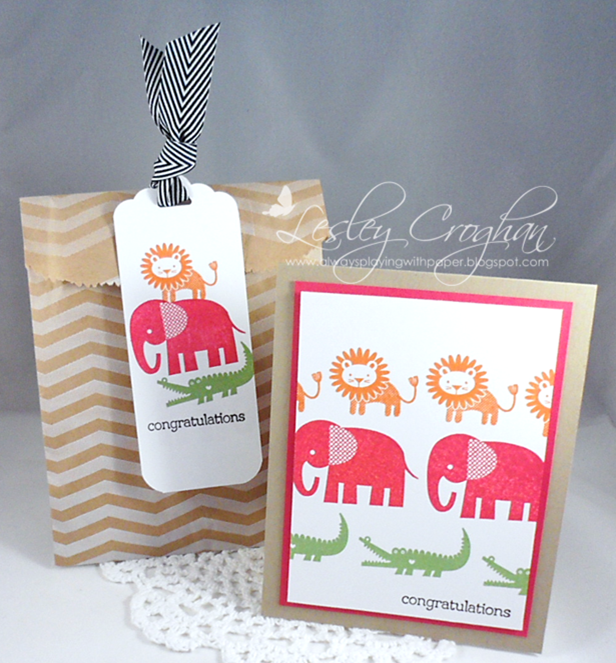 I love your little Zoo Babies card and I definitely want to play with your sketch, because that is one of my favorite ones for using up DP scraps!!! Oh, the little bag is cute too! Oh gosh Lesley I sure hope the boo boos heal up soon, that sounds awful. Your projects are darling, love the little animals! Oh you poor thing! Sounds painful, l hope you heal quickly. 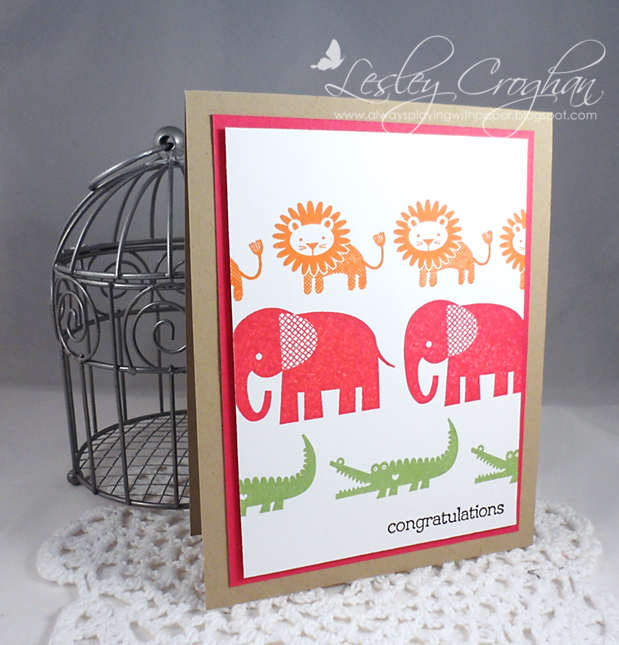 Your card and tag combo is just adorable Lesley...love Zoo Babies and a great colour combo this week. Hi Lesley. I hope you are doing better today. That sounds super painful. A few years ago, I was in such a hurry to get to J.C. Penney's on Black Friday that I was walking super fast across a snowy old train track from a parking lot (I grew up in that town and knew it was there, but forgot about it in the dark and snow) and caught my foot in one of the tracks. In trying to catch myself before I fell, I caught the other foot in the next track and went down hard on my stomach and my feet come up behind me. Knocked the wind out of me and ripped my gloves to shreds. After I got my wind back, all I could do was giggle with embarrassment. LOL Anyways, cute projects! Yikes, I'm so sorry about your fall, I was cringing just reading about it. Hope you feel better soon. Your animal baby gift set is adorable! Love the color combo. So sorry you fell! I hope the damage isn't too bad or longlasting. I love this card and have used it for inspiration for my card on Thursday. Ouch, so sorry you took a fall, but thankful it wasn't any worse (although it is bad enough). Hope you heal real soon. Love your sweet card and little bag. Will have to give this sketch a try. Oh my Lesley, you were very lucky not to break anything. I guess this is quite common with the awful conditions you have over there. Take care. Love your really sweet set, the animals are so cute in those colours. Sorry...I just saw this post...I am so glad you didn't get more seriously hurt! You must be really really sore by now! Hugs to you! Your card is adorable too! Oh my goodness Lesley I hope that you are okay. Sometimes it's so easy to forget that the snow is slippery! Oh my gosh I love this! So fun when a card looks this good and it's all stamped ! Now I want this alligator stamp! Forgot to say I hope you are ok and sooo sorry you fell. Lelsey, my friend, I hope you heal quickly. What a dreadful way to start the day and I can imagine how shook up you were after your fall. Big hugs! Ohh...I'm so sorry you slipped, bet you are so sore! I slipped on water in the street once going out to the mailbox (for crafts) and when I went inside and told my sons...their first comment was, "Did anybody see?" Not, did you break anything, just did any of their friends see their mother laying in the street! I am going to play along with your challenge today...cute sketch and I love the sweet little animals in their bright colors marching across your card. Hope you aren't too sore! I bet that hurt! What a horrible way to start the day! When I fall the first thing I do is look around and hope no one saw, and then I can cut loose the tears! I hope you are ok and not too many bruises. Ouch :(. I hope you recover quickly, falls like that are never good. Your card is adorable, the critters are fantastic. Lesley, so sorry to hear about your fall, I hope you are feeling better, no fun at all! I love your card and what a fun challenge too. Your sweet little animal parade is adorable...looking forward to playing along. 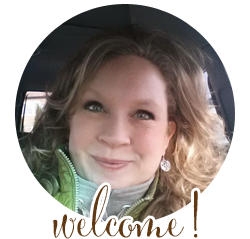 Baby Blog Hop for Jinny! SRM Stickers & Paper Sweeties!